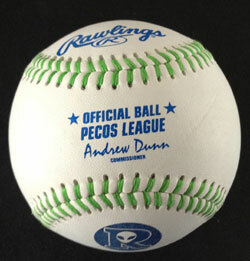 7/12/2012- The Pecos League and the Roswell Invaders are pleased to release the Alien Baseball. All other teams in the Pecos League received their baseballs earlier in the season. This is a one of kind baseball with a color of seem that has not been previously produced by Rawlings. These balls will be for sale at select Roswell Invaders Home Games, the UFO Museum and the PecosLeague.com online store.